Sarah Nader- snader@shawmedia.com Kings goalie Daniel Kross (left) from Jacobs High School blocks pucks during practice at the Crystal Ice House in Crystal Lake Tuesday, April 29, 2014. The Kings hockey program is a co-op team made up of Jacobs, Dundee-Crown, Hampshire and Huntley. This is the only team in the area that plays high school and club together, creating a cohesiveness during a year when the players will play around 65 games a year together. Sarah Nader- snader@shawmedia.com Kings hockey players listen to their coach during practice at the Crystal Ice House in Crystal Lake Tuesday, April 29, 2014. The Kings hockey program is a co-op team made up of Jacobs, Dundee-Crown, Hampshire and Huntley. This is the only team in the area that plays high school and club together, creating a cohesiveness during a year when the players will play around 65 games a year together. Sarah Nader- snader@shawmedia.com Kings cocah Joe Fell talks with his team during practice at the Crystal Ice House in Crystal Lake Tuesday, April 29, 2014. The Kings hockey program is a co-op team made up of Jacobs, Dundee-Crown, Hampshire and Huntley. This is the only team in the area that plays high school and club together, creating a cohesiveness during a year when the players will play around 65 games a year together. 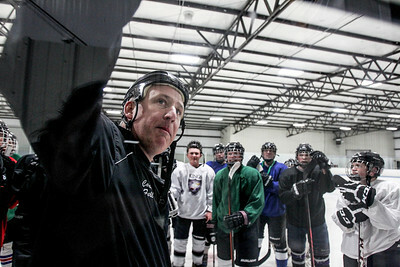 Kings cocah Joe Fell talks with his team during practice at the Crystal Ice House in Crystal Lake Tuesday, April 29, 2014. The Kings hockey program is a co-op team made up of Jacobs, Dundee-Crown, Hampshire and Huntley. This is the only team in the area that plays high school and club together, creating a cohesiveness during a year when the players will play around 65 games a year together.